Democrats and Republicans are used to playing dirty -but not like this. Last night at RFK Stadium, Members of Congress from both parties went head to head in The Capital Soccer Classic, hosted by the US Soccer Foundation and POLITICO. Read what you will into this pundits: Democrats beat Republicans, 7 to 6. It was a scoreless first half, largely because of the efforts of Swalwell, who as the goalkeeper for the Democrats made numerous saves against the Republicans’ strong offense. However, the Democrats scored three goals in quick succession to open the second half. The Republicans answered with one goal, but following another goal by the Democrats with just over a minute left, the score was 4-1 by the end of regulation time. 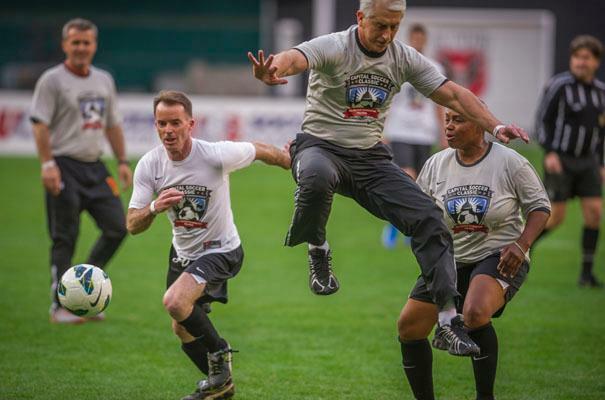 The list of sporty member who took to the field includes: Rep. Chris Van Hollen (D-MD), Rep. Mike McIntyre (D-NC), Rep. Erik Paulsen (R-Minn.), Rep. Dave Reichert (R-Wash.), Rep. Eric Swalwell (D-Calif.) and Rep. Todd Young (R-IN). They were joined by DC United coach Ben Olsen and former US Olympic athlete Staci Wilson.